Home to the Auburn University Baseball Team! Located across the street from Beard-Eaves- Memorial Coliseum, Samford Stadium at Plainsman Park. It was renamed Hitchcock Field at Plainsman Park in 1997, in honor of Billy and Jimmy Hitchcock who were great athletes in the 1930s here at Auburn. 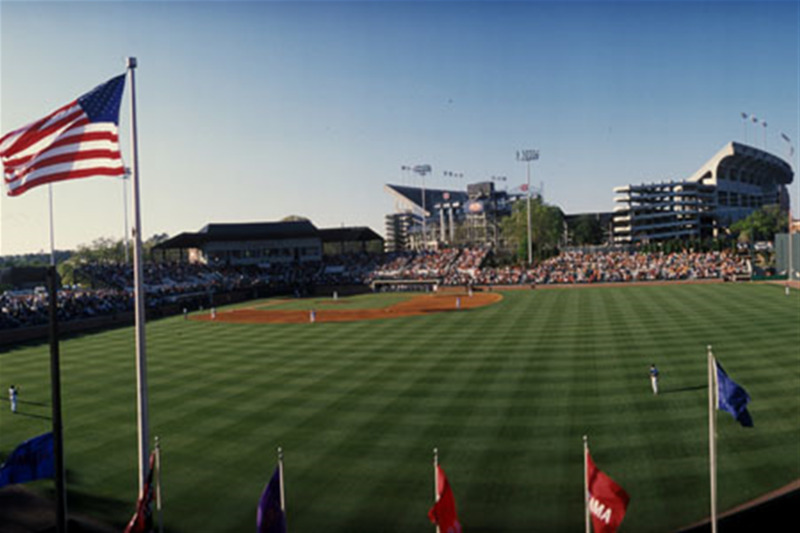 Then it was renamed Samford Stadium at Hitchcock Field at Plainsman Park in 2003, after long time trustee member Jimmy Samford. Samford Stadium at Hitchcock Field at Plainsman Park was voted the best collegiate baseball facility in the country by Baseball America prior to the 2003 season. Features the 37-foot “green monster” wall, which mimics the design in Fenway Park. It seats 4,096.